Our favorite comedy writer who writes about comedy writing and who has no idea TVWriter™ or Larry Brody or any of us here exist proves his genius by actually “getting” THE NEWSROOM. But essentially THE NEWSROOM was BROADCAST NEWS as written by Aaron Sorkin. James L. Brooks wrote that terrific movie along with co-creating THE MARY TYLER MOORE SHOW. So that got me thinking — what if Aaron Sorkin wrote THE MARY TYLER MOORE SHOW? Here, with great affection for Mr. Sorkin, is how I envision what a scene might look like:INT. 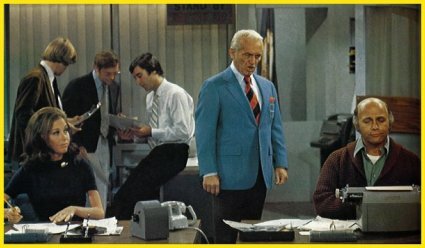 W.J.M NEWSROOM – DAYMARY AND MURRAY ARE WORKING AT THEIR DESKS. SUE ANN ENTERS. SUE ANN: Hello, union mules. I’m in a wonderful mood. Care to guess why? MURRAY: You just learned you’re not part of the 17.8% of the population that has a venereal disease?